A retrospective study revealed an increase in the incidence of colorectal cancer (CRC) in patients <50 years across all income brackets and demographic groups, according to investigators from The University of Texas at Austin Dell Medical School. The findings were presented at the 2019 Gastrointestinal Cancers Symposium. Cases were analyzed from the National Cancer Database, in which 1,185,763 patients with CRC were identified. Over the study period, the pro- portion of patients who received diagnoses at <50 years increased from 11.5% in 2004 to 14.3% in 2015 (P <.0001), and these patients presented with more advanced stages of their disease (FIGURE 1). Patients who received diagnoses at <45 years were more likely to have poorly differentiated disease, which tends to be more aggressive. Despite this, survival in this population is higher than in the ≥50 years group (FIGURE 2). 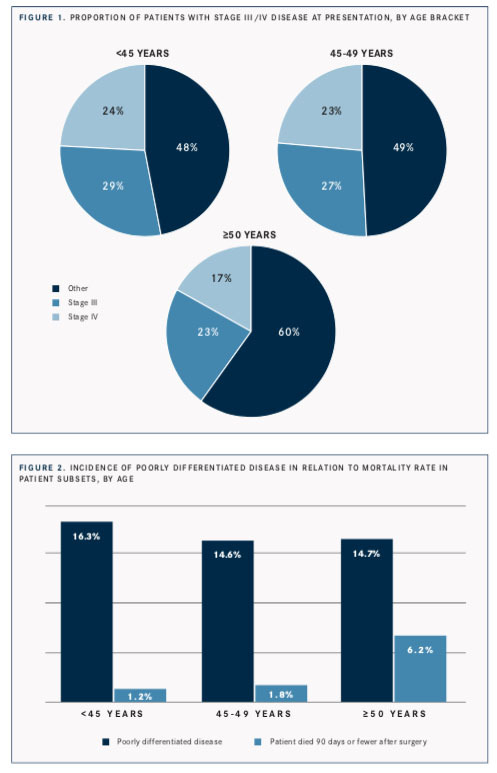 Diagnoses in men <50 years rose in non-Hispanic whites but in no other demographic group (P <.0001). Conversely, women of all racial and ethnic subgroups saw an increase in diagnoses at younger ages over time (P <.01). Patients from all income brackets experienced an increase in CRC diagnoses; however, those in the highest income quartile (≥$63,000) saw the greatest rise. Interestingly, in 2005, patients <50 years with private insurance typically received diagnoses at lower rates compared with patients without insurance or Medicaid. By 2015, the gap had closed and patients in all subgroups were receiving diagnoses with similar frequency. In addition, the incidence of younger-onset CRC rose in urban areas (P <.001) but not in rural areas. The investigators thought these changes were due to factors such as better access to healthcare or an increased risk from healthcare exposure, such as antibiotic use. Investigators stated that the United States Preventive Services Task Force should update its recommendations to start screening at an age earlier than 50 years. The American Cancer Society has already revised its guidelines to advise screening at 45 years. Goodgame BW, Virostko J, Capasso A, Yankeelov T. Recent trends in age at diagnosis of colon cancer in the United States, 2004-2015, a National Can- cer Database study. Poster presented at: 2019 American Society of Clinical Oncology Gastrointestinal Cancers Symposium; January 17-19, 2019; San Francisco, CA. Abstract 490. bit.ly/2U5A1HB.